Looking towards the constellation of Triangulum (The Triangle), in the northern sky, lies the galaxy pair MRK 1034 as seen in this space wallpaper. 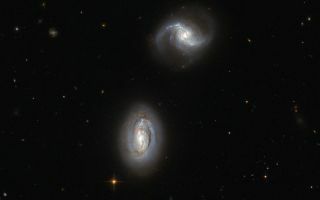 The two very similar galaxies, named PGC 9074 and PGC 9071, are close enough to one another to be bound together by gravity, although no gravitational disturbance can yet be seen in the image. This image was released June 24, 2013.